Home decor is therapeutic. You need not be a trained interior designer to work upon your home decor. You can bling up a simple decor with bare minimum accessories like I do. yes, I am a fan of "minimalism". I like to keep my home simple, clean and minimally styled. The heavy ornamented looks not just makes the room look busy, bringing maintenance challenges, but they conceal the concept of space. Since we stay in rented apartment and need to change city anytime, there is a little interior investment that we can do. Besides, minimalism rocks! One of my favorite home decor accessories are- Candles. Candles have not just restricted to lightening but have become a quintessential part of home decor. I love collecting candles and have few from USA and India. Yup candles! 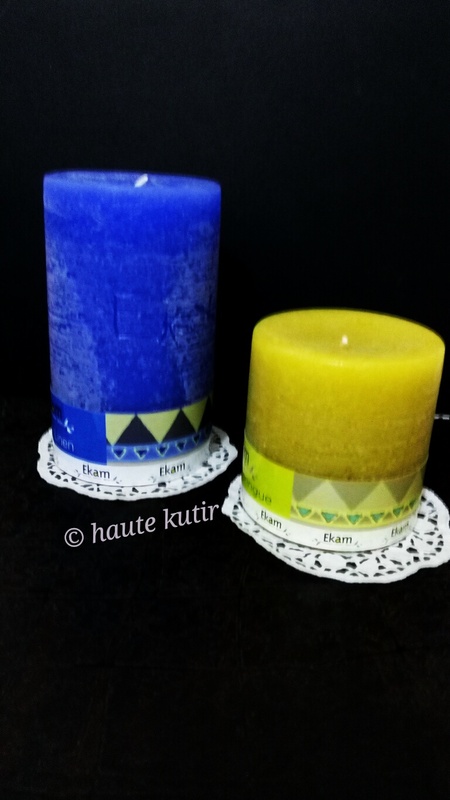 They are mini decor statements for your home and given the quality of candles that comes these days, laden with aromatherapy, decorative styles, forms, they leave you aching for more. Besides, they are quite an enhancer when you plan a cozy dinner party at home or just invite friends for house warming or Ghazal nights. 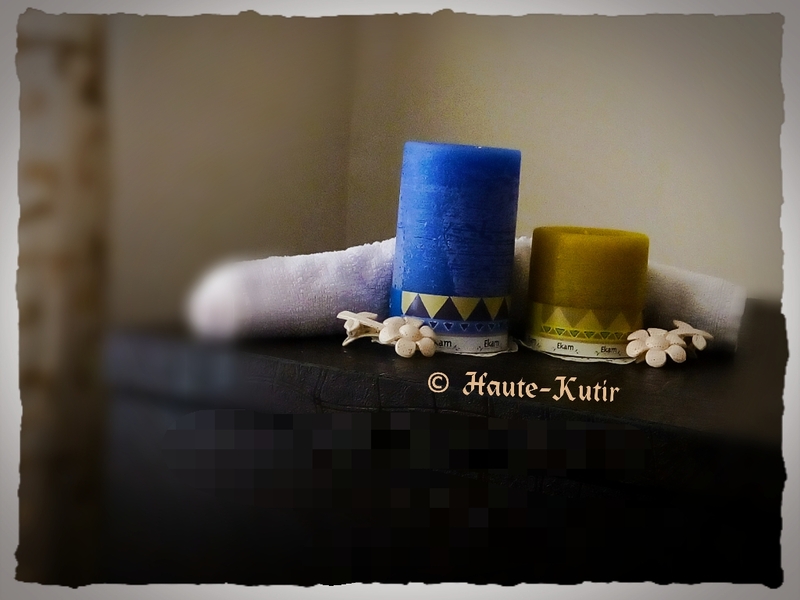 I have used pillar candles- one in Fresh Linen and other is Lemon Meringue to brighten up my bedroom with their vibrant colours. This blue and yellow combination looks neat on my brown solid wood drawer. This Fresh linen fragrance is a sunny fragrance, smells crisp and fresh just like a clean laundry. This irresistible scent will embrace just like fresh linens from laundry. It promises to enhance your mental and emotional wellbeing. I liked the deep blur color but the fragrance was little too strong for me. I have preserved this crispy fragrance for summer noon. Lemon Meringue: It is peppy and came in bright yellow.This fragrance is sheer lemon bliss, smells just like a freshly baked pie straight from the oven its a perfect blend of sun ripened lemons, sweet meringue and that warm flaky crust that you may love! The rustic lime green color of the lemon meringue scented pillar candle is so energizing & fresh. I used these candles on my wedding anniversary to surprise hubby at midnight. They were my perfect companion for last minute surprise and when lighted, they emitted mild fragrance and were quite a good assets for my minimal decor. Overall, I liked these two candles in terms of form. Reg the fragrance, the fresh linen was little too strong for me but the Meringue works. 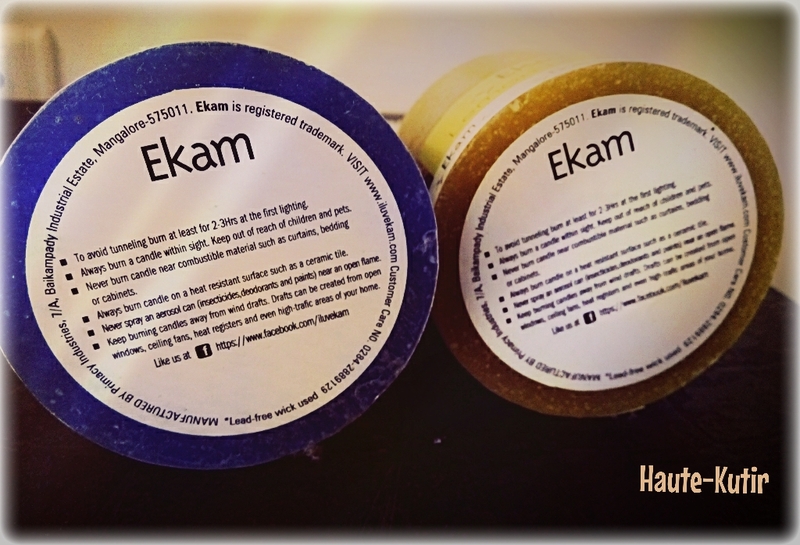 Ekam has quite a variety of candles includes cool water and lotus in their pillar range, which I may try soon. The Pillar candle son Ekamonline comes at the range of Rs 195 to Rs 360 depending upon the size. Will I try them again? Maybe yes, maybe an assortment of fragrances for different moods and occasions. PS you can follow us on Instagram, Twitter and Facebook.